Zeichen Press is Fran Shea, Jen Shea, and an old-school letterpress in Minneapolis, MN. Their cards are printed on 100% recycled (30% post-consumer waste) or 100% tree-free cotton paper developed especially for letterpress printing. So, besides being refreshingly honest and smartly designed, Zeichen Press cards are environmentally friendly. You can buy Zeichen Press cards at Papel in Cobble Hill, Brooklyn, or from their online store. 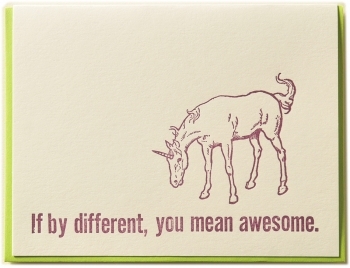 I love that unicorn one! Yes! The unicorn is the best! Naturally, I had you in mind for the unicorn Sarah! Siegel’s was my dream store when I was in HS. I loved going in there and browsing their extensive pen collections. Hahaha. Sad but true. It was fun working there! Sarah K. and I really liked the pen collection as well. It was there that I was first introduced to the Uniball Vision. I love buying cards and paper and pens, but I never send cards to anyone! I should really resolve that issue and start sending cards to people. Thanks for the inspiration, Thea!